This winter, we've been profiling a different Division II & III corps in a feature called "On the Field." Memphis Sound, based in Memphis, Tenn, is the flagship program of the Memphis Youth Performing Arts Association, founded in 2002. The purpose of the association is to promote music and performance as a platform for building a successful, healthy lifestyle. Memphis Sound completed its first year of DCI competition in 2003 as a Division II semifinalist at World Championships. Memphis Sound brings drum and bugle corps back to the mid-South for the first time in 20 years, and promises to bring a fresh, new look and flavor to the drum corps arena. Corps director Trey Moore was a tenor player and charter member of the Memphis Blues Brass Band from 1980-1982, the only other DCI corps to call Memphis home. "George Lindstrom, the Blues' director (now on the board of the Blue Knights), did an incredible job with our corps, fielding a top-20 unit in our very first year," says Moore. "I remember sitting in the stands of Legion Field waiting for our score to be announced. We went nuts!" Memphis Sound is not necessarily looking to follow in the footsteps of the Blues by having early competitive success. The board of directors is focused more on building a valuable youth program while creating a business framework that will sustain the organization. That does not mean that Memphis Sound will not be competitive in 2004, however. The corps has attracted a very talented instructional staff and support group. The corps has also scheduled a very ambitious summer tour. ccording to Moore, "If you are going to ask kids to give up their summer, you better provide them with plenty of performance opportunities. We decided early on that we would not be a part-time or weekend corps. Of course, you have to have the resources to get through a full summer. That's why we put as much emphasis on our board as we do our instructors." 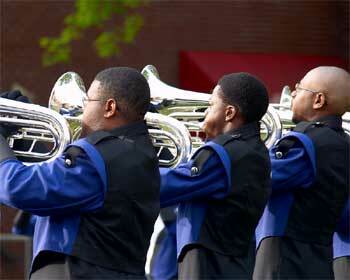 For its 2004 season, Memphis Sound presents a show called "Elements of Blue." "Elements of Blue" is an original composition in four movements by Terry Jolley, and is based on musical elements of blues and jazz with a symphonic flavor. "Elements of Blue" is a tribute to the rich blues heritage of Memphis, incorporating elements of the 12-bar blues, pentatonic scales, blues notes, jazz textures, and a musical conversation between different voices in the ensemble. "Elements of Blue" will appeal to the jazz lover, blues lover, drum corps lover and everything in between. Consider it an exploration of the elements of jazz and blues, with a hint of symphonic texture, developed to excite the senses of a drum corps fan. The 2004 staff of Memphis Sound includes Trey Moore (executive director), Kevin Tabb (program coordinator/percussion caption head), David Koelz (visual designer/caption head), Ryan Todd (brass caption head) and Emily Stevens (guard caption head). Memphis Sound's percussion staff includes Tim Matlock, Jeff West, Junius Rowland and Casey Kirk, while the corps' visual staff includes Ashley Lewis and Jeremy Tate. Rounding out the brass staff are Kelly Duncan, Benji McLain and Shane Fudge, while Kristin Kelly directs the guard. The corps' tour manager is Pat Bohannan, and its housing/administrative coordinator is Kimberly Bohannan. The board of directors for the Memphis Youth Performing Arts Association includes Jon Schrack, Mike Garvin, Kevin Bundy, Ann Trammell, Keith Hall, Dr. Sidney McKay, Phillip Breazeale, Jeremy Pringle, Preston Moore, Andy Johnson, David Knox, Tim Blabey and David Pickler.